London is going through a heatwave now with temperatures as high as 30°C. One of the things that I love most about Summer is how long the days are. My friends and I took advantage of this to have a picnic at Hyde Park to celebrate a friend's birthday. It was such a lovely day: we talked and ate for hours until the sun set. 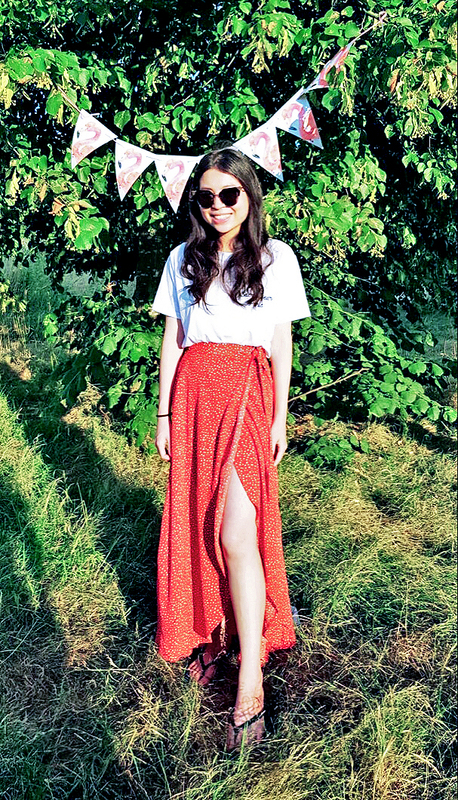 I wanted to keep cool and comfortable in the heat, so I wore a loose white t-shirt, and a floaty red and white polka dot maxi wrap skirt. The wrap style gives the skirt such beautiful movement and I can show some leg à la Angelina Jolie if I want to. ;D I feel that anything below my knees makes me look short and stumpy, so I try to wear at least a little bit of heel. These wedge flip flops are ideal because the wedge makes them as comfortable as flat flip flops and gives me a boost of height at the same time. Overall, the combination of wedge flip flops and maxi skirt gives an elongating effect, which is very much welcomed.